Good credit, Bad credit, NO credit? NO Problem! We offer up to 18 Months Zero % Interest w.a.c. We also offer great NO CREDIT NEEDED LTO solutions. Our goal is to see every person that walks in our store be approved for financing or leasing if they need it! We offer programs through Progressive Leasing, Synchrony bank, Snap Leasing, and others. We offer solutions to people who are credit challenged and we still provide an honest low price. Good credit, bad credit, no credit at all! It doesn't matter when you apply for our purchase options, you can still get approved! At I35 Furniture our focus is bringing modern designs and stylish designer furniture to our customers at prices they can afford! We have offered the absolute best prices on all Quality Modern Living Rooms , Bedroom , Dining Room, Pub tables, Sectionals, Quality Mattress and Bedding, Bar Stools, Bar tables, Bunk Beds, Youth, Discount Motion Sofas Living room, Reclining Discount Living room, Discount Formal dining room, Quality Discount Casual dining room, TV stands, Theater seating, wall units, art and rugs, Home and Office furnishings and more in Dallas, Fort Worth, Arlington, Addison, Plano, Downtown Dallas, Uptown Dallas, Denton, Mesquite, Hurst, Euless, Bedford, Mckinney, Frisco, Little Elm, Lewisville and Carrollton since day one. 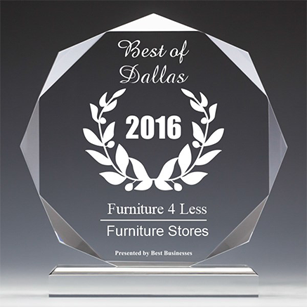 We have proudly offered the Best discount Prices on Quality furniture in Dallas. We don't sell cheap products, we sell Quality furniture at Discount prices. We cut out the high overhead costs of larger stores and pass those savings on to you. At Designer Furniture 4 Less your satisfaction is our guarantee! We work hard to bring you the modern furniture styles you'll love at the best possible prices!